Courtesy Marion Leary; ImmERge Labs. 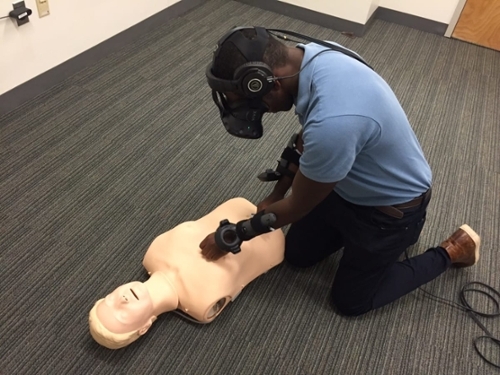 Virtual and augmented reality bring authenticity to CPR training that better prepares responders for actual emergencies. The woman on the treadmill next to you at the gym collapses. You rush to her side, but she’s not breathing and has no pulse. Do you know what to do next? If not, virtual reality may be the key to saving her life. Unlike a heart attack, which occurs when blood flow to the heart is blocked, sudden cardiac arrest (SCA) is triggered by electrical malfunction. It comes on suddenly and often without warning. The heart stops beating. Blood can’t reach the brain, lungs, and other vital organs. The victim loses consciousness and, without treatment, will die within minutes. But SCA is reversible — and not only by emergency room doctors. Automatic external defibrillators (AED) and bystander CPR can double or even triple the chance of surviving SCA. Unfortunately, bystanders — that’s you, bending over the treadmill — rarely perform CPR during this critical window. Those who don’t intervene cite lack of confidence and a reluctance to act. Relatively easy to learn, CPR training has been available to the public for over 50 years. But in that time, SCA survival rates have barely improved. Marion Leary, director of Innovation Research for the Center for Resuscitation Science at the University of Pennsylvania, suspects that current CPR certification training may be hampered by a lack of realism. Doing chest compressions on a mannequin in a classroom under the watchful eye of an instructor doesn’t adequately prepare people for the urgent reality of a living, (non)breathing human collapsed beside them, her life literally in their hands. That’s why Leary and her partners at ImmERge Labs have designed virtual and augmented reality applications to provide a more realistic and immersive training experience and hopefully save more lives. To simulate the in-the-moment experience of attending a victim of SCA, ImmERge Labs have developed a 3.5 minute long, high-definition virtual reality (VR) simulation set on a city sidewalk. The participant dons an HTC VIVE head-mounted display tethered to a powerful laptop. When a passing avatar collapses, a real-life CPR manikin is inserted where the avatar falls. Two external VIVE Lighthouse infrared sensors track the relative locations of the participant and manikin during the simulation. The trainee interacts with the manikin while immersed in the complex multi-sensory environment. Within the simulation, they can communicate with other avatars and perform CPR on the manikin. If we want people to be prepared to respond in an emergency . . . we need to train them in a way that heightens their stress and anxiety so they are more apt to respond and not freeze. ~ Marion Leary. After the simulation, Leary plays back a recording of the session and debriefs the participant about what was done right and what could be improved, followed by a review of the American Heart Association cardiac arrest Chain of Survival. Another innovation switches the focus to improving technique. The trainee performs CPR on a sensor-laden manikin that has been integrated with Microsoft’s HoloLens platform. When pressing on the manikin’s chest, the participant sees a holographic rendering of the manikin’s blood flow and circulatory system via the HoloLens—though it’s also compatible with other AR platforms such as Meta. “The quality of the trainee’s CPR technique determines the flow and vibrancy of oxygenated red blood to the vital organs in real-time,” says Leary, and the manikin’s sensor reading provides trainees with a CPR quality score. Leary has successfully tested both applications in training sessions with the University of Pennsylvania’s Center for Resuscitation Science and at an event for the general public with her local American Red Cross chapter at a Microsoft Store. In the future, ImmERge Labs intends to develop VR and AR content for other time-sensitive emergency medical situations, such as stroke, active shooter, first aid, and anaphylactic shock. Ultimately, Leary hopes to use technology to change the paradigm of CPR training and provide graduates the confidence to act when they are needed.